BEIJING (AP) -- China's auto sales sank for a fourth month in October as an unexpectedly painful slump in the global industry's biggest market deepened. Purchases of SUVs, sedans and minivans contracted 13 percent from a year earlier to just over 2 million units, the China Association of Auto Manufacturers reported Friday. 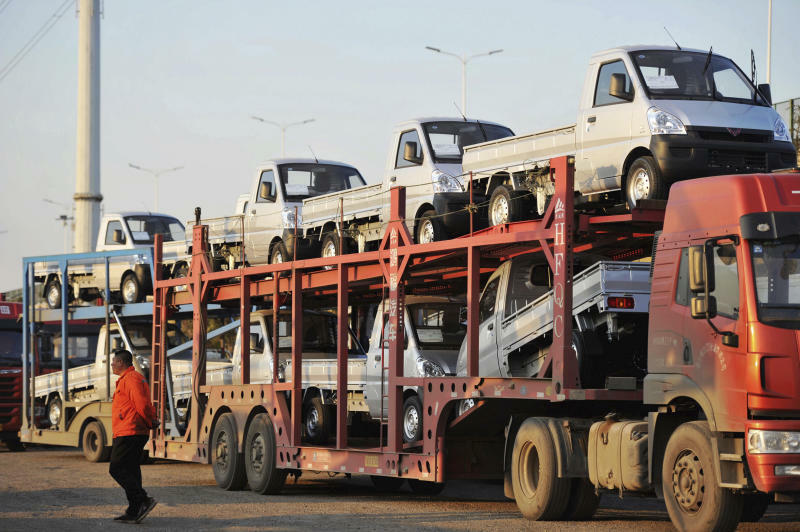 Auto demand had been forecast to weaken after Beijing clamped down on bank lending late last year to cool a debt boom. But the slump is sharper than expected, prompting expectations regulators might try to prop up sales with tax cuts or other incentives. The downturn comes at an awkward time for global and Chinese automakers that are spending heavily to meet government targets to develop and sell electric models. It adds to challenges for communist leaders as they try to shore up cooling economic growth and fight a tariff war with President Donald Trump over Beijing's campaign for state-led creation of global champions in robotics and other technology industries. Sales for the 10 months through October fell 1 percent from a year earlier to 19.3 million vehicles. That was well below forecasts of growth in mid-single digits after last year's anemic 1.4 percent expansion. The slowdown is a "normal correction" following years of rising auto ownership levels, said Zhang Xin, an independent industry analyst. "The bad overall environment has played the biggest role," including a cooling economy and restrictions imposed by Chinese cities on car ownership to curb congestions and smog, said Zhang. If economic conditions sour, "people will cut expenses by not buying a car," he said. Total vehicle sales, including trucks and buses, shrank 11.7 percent in October to 2.4 million. For the year to date, they were off 0.1 percent at 22.9 million. October's decline was worse than September's 12 percent contraction. VW, which vies with GM for the status of China's most popular brand, said sales declined 9.8 percent to 274,000. Sales for the first 10 months of the year were up 0.4 percent at 2.5 million. Nissan Motor Co. said October sales shrank 5.5 percent to 142,078 vehicles. CAAM gave no details of October purchases of SUVs, the industry's profit engine, but said year-to-date sales growth slowed to 1.6 percent from September's 3.9 percent. Sales of gasoline-electric hybrid and pure-electric vehicles rose 51 percent to 138,000. For the first 10 months of the year, purchases rose 75.6 percent to 860,000. Chinese domestic brands that had been expanding their market share with lower-cost SUVs and sedans suffered an even bigger decline in October. Sales contracted by 18 percent from a year earlier to 852,000 vehicles. Sales of Chinese-brand SUVs sank 21.8 percent to 498,000. Year-to-date sales were off 3.6 percent at just under 8.1 million. Their total market share shrank 2.5 percentage points to 41.6 percent.